One of your sessions can be held in a local supermarket. Linda will walk through the market with you aisle by aisle and show you the best products for nutritional content value. 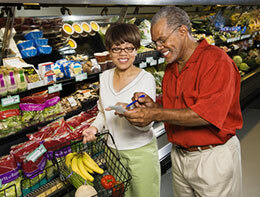 This is a great chance to look at convenience foods that will make life easier when you are busy. Yes, Linda says there are many tasty prepared food items that have quality and can help you to reach your weight loss goal and lower your cholesterol, blood pressure and blood sugar. It is important that you always eat the right meals at the right time, which will help you to implement healthy eating habits. Linda has designed a Customized 8-Week Program for people who want the Royal Treatment. To start changing your eating habits, call Linda at (925) 855-0150 or Email her and begin feeling healthy again.